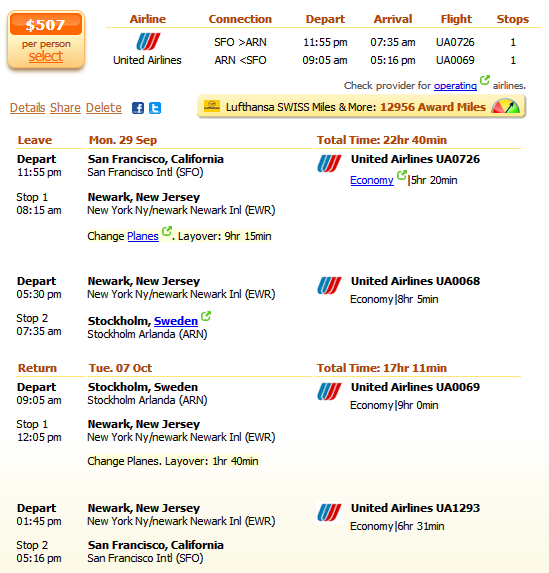 This time our deal hunters have found a super cheap flight to Stockholm for $507 round-trip, with taxes. Book this flight by United Airlines and save more than $200 compared to the company with the next cheapest airfare deal. We have found this offer while searching on Travelgrove – it is provided by FlyFar. If you want to find the same deal, search the below box, but do not only check Travelgrove, check the competitors as well, so you can be sure that you are purchasing the cheapest ticket. The flight departs on September 29 from San Francisco International Airport (SFO) and comes back from Stockholm Arlanda Airport (ARN) on October 7. There is a stop in Newark, NJ both ways, the first if 9 hours 15 minutes long and on the flight back it’s only 1 hour 40 minutes. The frequent flyer program United belongs to will give you 12,956 award miles if you book this airfare, which is nearly 25% of the amount necessary for a free flight to Europe. The United Airlines flight costs $507 r/t, but the next best offer, a multiple airlines airfare (operated jointly by United and Austrian Airlines) is $712, exactly $205 more expensive than our deal. Check the table for more airlines and book this flight before all seats sell out! *Featured prices include taxes and fees. This entry was posted on Tuesday, April 22nd, 2014 at 6:14 am and is filed under Airfare Deals. You can follow any responses to this entry through the RSS 2.0 feed. You can leave a response, or trackback from your own site.